You are most certainly moving your life to another country, but definitely not all your things. Most household items, toiletries, common medications, and clothing can be bought in Japan. You really only want to pack enough to sustain yourself for the first two months of life on JET. After you get your first paycheck, you can start fortifying your homestead. Follow our JET Program Packing Guide to make sure you don't end up bringing a bunch of crap you don't need. This may change year to year and depends on air travel regulations. So check with your JET Program Coordinator for details. In general, you are allowed two large bags (weight allowances vary) and one carry-on. One of your large bags will be shipped to your Contracting Organization (CO) ahead of you as soon as you land in Tokyo. The other will stay with you. Keep this in mind while packing so you don't accidentally pack your Tokyo Orientation dress clothes in the luggage that gets shipped ahead of you. You need $1,000-$2,000 to live on while you wait for your first paycheck. Some say $2,000-$3,000. The amount is up to you. The reason for this is Japanese paychecks are paid at the end of the month after they are earned. Thus, you need money to set up your new apartment and live for two months before you get paid. This comes out to about $1,000-$3,000 (depending on who you ask). Try to get the money exchanged to yen before you depart. This can be done in Japan, but you'll have a lot on your plate. So having cash ready to go will be a nice convenience. Members of AAA in the United States can get currency exchanged and shipped to them for a shipping fee of $15. Orders over $1000 waive the shipping fee. To get this done in person, visit your nearest AAA office. Similarly CAA, Britain's AA, and other automobile associations offer currency exchange. Your bank should be able to exchange your money for yen as well, though rates and delivery times may vary. Your goal is to get this money into your Japanese bank account ASAP and live off of it for two months. So party a little at Tokyo Orientation, but not too much. This is sent to you in the mail before you depart, so don't forget it. Pretty instrumental item. Your passport has to be sent away to the embassy after your acceptance so the JET Desk can apply for your visa. It sent back to you in the mail, along with your brand new instructor visa, before you depart. Don't forget to pack this. Also known as the Terms and Conditions. Sometimes you won't get this before you leave and will receive it once in Japan. If you've got it, throw it in that suitcase. This is the handbook JET gives you and it's pretty invaluable. However, it's up to you whether you want to pack it because it is available online from most countries' embassies. This is your life. How else will you read Tofugu? Bring some pictures from home. First, for yourself and your home. Mementos are an easy way to make your Japanese apartment feel more homey as soon as you arrive. Second, for your self-intro lesson which is the first thing you will teach when you arrive in Japan. Kids love pictures, as they say. Your JTEs (Japanese Teachers of English) who you will be team teaching with. Do this at your discretion. If you teach at multiple schools, this could be 30+ people. As for what to buy, something consumable, individually wrapped, and non-melty is best. If it's unique to your country, even better. Candy and tea bags go over well. Avoid chocolate at all costs (it will melt). Bring only enough toiletries to last a week or two. You'll soon be placed snugly in your apartment and able to buy necessities from local stores. Deodorant: Contrary to popular belief, you can find deodorant in Japan with anti-perspirant strong enough for foreign sweat. But it takes some searching, trekking, online-ordering and/or kanji study. So bring one or two extra sticks or bottles of a brand you know works for you. But don't go overboard. You can find these things with some time and effort. Unfortunately you won't have time and effort to spare for a few months after arrival. Make-up: Same deal as deodorant. It can be found in Japan or online, but you might not be free enough to search for it right away. Bring enough of your favorite brand to last at least two months. Hair Care Products: Only if you're, like, really into hair. Toothpaste: Most toothpastes in Japan don't contain fluoride, though Japanese Aquafresh usually does. Check the ingredients for フッ素 or フッ化ナトリウム. You won't die without fluoride, but try and keep your teeth as pristine as possible, because finding a quality Japanese dentist can be a challenge. Pack an extra tube or two. Foundation/Face Make-ups: Okay, I lied about the make-up thing up there. Finding face make-up in Japan that matches all skin colors can be difficult. Bring as much as you need and be prepared to order the rest online. So says this smart lady. For most common "stock" meds, you can wait until you're in Japan to buy and fill your medicine cabinet. However, there are a few exceptions. "Your" medication: This means anything that you are taking and need to take indefinitely to survive. Before you leave, tell your JET Program Coordinator about your medications and find out if they are available in Japan. You will need to pack a month's supply to hold you over until you can get a prescription from a Japanese doctor. Make this order number one as soon as you're settled. Talk with your supervisor about getting a prescription. Bringing more than a month's supply of medication to Japan requires that you fill out a Yakkan Shoumei form, which allows a year's supply. Birth Control: Birth control in pill form is available through prescription in Japan. You should be able to get it prescribed soon after you arrive, so be sure to pack one month's supply to hold you over. Birth control in ring or patch form is not available in Japan. Headache medicine: You'll probably get a headache sometime between the time you depart and the time you arrive in Japan. Keep this in your carry-on. Do NOT bring any meds into the country that are prohibited. Amphetamines, such as Aderall, and pseudoephedrine, such as Sudafed, are outlawed in Japan. Check with your JET coordinator to see what is and isn't allowed. If you bring these meds to Japan, you will go to Japanese jail, which is much less fun than other types of jails. If you know you will need a car in Japan, make sure to apply for an international driver's license in your home country. It will be valid in Japan for 12 months. You can do this through various auto associations in various countries. After your IDP expires, you will need to apply for a Japanese Driver's License. This can be easy or hard depending on your country of origin. Some country's expats have to take more tests than others. But no matter what, you will need your license from your home country. More information can be found here. Stickers: Stickers in Japan are way too expensive and sold in small quantities. Pick up some character stickers at a teaching store in your home country. They're easy to pack and make lessons a breeze. A few stickers can go a long way toward motivating a lackluster class. Map of your town, country, or the moon: Maps are a great way to introduce your home country and home town. They're big, easy to see, and fun. A map of the moon may be less necessary, but as they say, kids love the moon. Realia: Any real props from life in your home country that you think students would enjoy seeing and passing around. Only pack these if there's room left over in your suitcase/the item isn't that big. Bulky realia items can be sent for or ordered online. Pictures: We already talked about this, but hey! Here it is again. Most of your second suitcase, which is shipped to your Contracting Organization, will be filled with clothes. 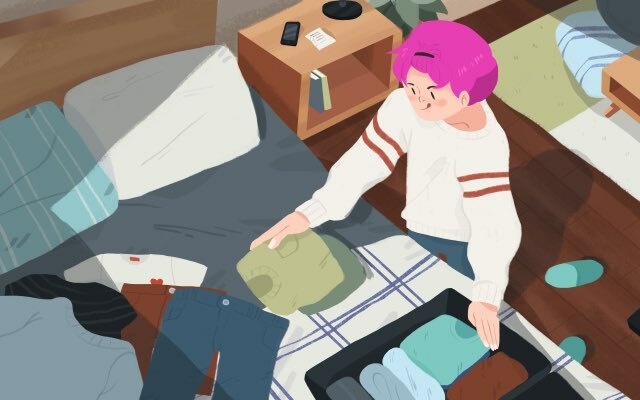 How much clothing to pack is a tricky subject when moving to Japan because Japan has clothing. You can buy clothing in the country of Japan. Depending on your size, however, you may have issues finding clothes that fit. You may be fine buying shirts, but pants don't fit. Or pants are fine, but shoes are too small. Women tend to have more problems than men in this area, so keep that in mind. Packing clothing will depend largely on your personal build and preferences. 2 or 3 business outfits. Suits for guys. Dress suits for ladies. Basically what you wore to your interview. Have two of those. Casual wear for the times you're not conferencing. Pajamas for night sleeping. You will be rooming with one or more new JETs. So it's good to have something to wear that's appropriate for rooming with strangers. Schoolwear depends on the school. It's tough to follow a dress code for a place you've never been to, but you have to try anyway. Here's some tips on packing for this weird situation. 2 or 3 business outfits. Hey! You already did this one. Good job. Most schools don't require formal attire every day, but you might need to dress up for a few meet ups or receptions when you first arrive. So don't throw your nice clothes in the trash after Tokyo Orientation. 4-5 teaching outfits. Check with your predecessor or CO to find out what kind of clothing is required for teaching day to day. More than likely it will be business casual. "You" clothes. You won't want to dress like an ALT 24/7, so bring a few outfits that you can wear after school and on weekends. Be aware that what might seem appropriate in your home country's culture, might not be in Japan. No matter what, you will need dress shoes for Tokyo Orientation, as well as at least one pair of comfortable shoes. Take note, shoes in Japan run small. The biggest size for women is a US size 10, though sizes past 7.5 are harder to find. For men, size 13 is the highest, but sizes beyond 10 are harder to find. Check out these conversion charts for women and men for more info. All this to say, if you need sizes bigger than those offered in Japan, it may be worth bringing a few extra pairs if you have room in your suitcase. You will need a special pair of shoes for use inside the schools, since you will take off your outdoor shoes when entering school. You will be wearing these shoes 8 hours a day and this can really affect how well you do your job. If your shoe size is bigger than the maximum Japanese size, definitely pack a pair of comfortable, durable slip-on shoes for work. Your school shoes should be brand new and have never touched the outside ground. Some ALTs wear Crocs as their school shoe. Women: Bras in Japan may have disparate cup and torso measurements. So it can take some searching to find a brand that fits comfortably. Bring enough to wear indefinitely and plan to find sources for new ones later on down the line. Men: Underpants may run small, so buy a size larger and you should be okay. That said, you should still pack underpants. If you're going to a cold area like Hokkaido, pack a few cold weather items just in case it gets blustery before fall. In general, plan to ship your winter clothes or just buy new winter clothes when the winter finally sets in. No matter what, it's good to pack a jacket or two for chilly days, but don't go overboard. If you're assigned to a very cold region, appropriate clothes will be available at local stores. This one is up for debate. In years past, it was definite "don't pack" item. But more recent iPhone and Android phones (anything that supports 3G or 4G) can work in Japan. But there could be caveats and exceptions that make your phone useless. Of course, you can still use it to browse the internet anywhere there's wifi. Considering you're going to Japan to live semi-longterm, it's probably worth getting a Japanese smartphone for the duration. You're current phone will be obsolete in a few months anyway. I knew a guy who tried to bring his bike to Japan. Possible but expensive. You've got enough to deal with and there are plenty of bikes in Japan. Same deal as the bike. Too bulky and expensive to ship. They're heavy, take up too much space, and are impractical. As Egon Spengler once said, "Print is dead." Get a Kindle. Stream it, baby. You don't need TV anyway. Just watch Tofugu's YouTube channel. Buy one (or seven) in Japan. Don't try to bring a supply of anything to last you more than a few months. The idea of moving in Japan is to live in Japan. There's nothing wrong with having some comforts of home every once and a while. But you will ultimately have to say goodbye to some things and accept what is available. If you really need a fix of something from home, most everything is available online for a price. Buy some space saver vacuum bags to get more mileage out of the second suitcase. When packing items like toothpaste and shaving cream, put them in plastic bags to avoid leakage. You don't want toothpaste all over your nice clothes. Stuff things into things! Think of every space as useable. Empty shoes? Stuff some socks in there. Empty gloves? Fill them with childhood mementos. Roll clothing instead of folding. Make a pile of things you can have sent after you. If you pay for the cheapest rate possible, it may take a long time, but all your stuff will get to you eventually. It's like sending a care package to yourself! Use this for winter clothes, personal attachments, and furnishings you can't do without. The first few months of your time on JET are hot and humid months, so pack accordingly. Plan to buy winter clothes a little bit later or have them shipped from home. Japanese fashion is arguably more conservative than what you might be used to. This is especially true in the schools, so keep this in mind when packing work clothes. What you wear on your own time is your business, but bear in mind that people in your town know who you are and your students will see you pretty much everywhere you go. If you're wearing a leopard print tank top and spiky boots outside the local 7/11, don't be surprised if students and teachers know about it the next day. Check out this awesome article to figure out what you can and can't find in Japan. Make sure all your bills are paid in full. Close the accounts you won't be using in Japan, which should be all of them that aren't financial. Though you may be tax-exempt in Japan for the first two years, you still must file taxes for your home country. If you earned money at all in the year before JET, bring the W2 and other forms with you so you can do your taxes that first year in Japan. Your bank account and credit cards might get locked up because you're using them from a new country. Call each institution and tell them to expect activity in Japan. If you have student loans, you probably already pay them online. In case you don't, set up online payments before you go. You can easily pay your loans with all the JET money you'll be sending to your home bank account. You probably won't need this, but you never know when a legal matter may arise in your home country that you'll need someone to deal with. Grant Power of Attorney to a trusted friend or family member who can sign documents and handle affairs in your absence. As soon as you finish Tokyo Orientation, you'll be whisked off to your new home prefecture. You may get some down time before meeting people and you may not. Your first day in your new home could be filled with meetings and introductions with teachers, coworkers, principals, supervisors, and mayors. This is to honor you and make you feel welcome, so bear with it though you might bet tired. All this to say, prepare and memorize a little self-introduction. Check out this article on jikoshoukai for more on what to say and how to say it. Have a Japanese proficient friend or fellow JET at orientation check it over if you're not sure. Then memorize and practice. JET Program Packing Complete! Now Get on a Plane. Pre-departure is definitely a hectic time. Do research, make a plan, and take it in stride. Soon, you'll be in Japan and it'll be time for the post-arrival checklist.